This is the state-of-the-art and musically satisfying. When Ed Meitner brings out a new digital player I pay particular attention, especially with the new EMM Labs XDS1 CD/SACD reference player/converter. Why? Because I was bowled over three years back by the one box CDSA SE that I just refused to send back after writing my review. My CDSA works better today than ever, due to a drive upgrade EMM Labs made available along the way. The purity of sound, the superb imaging and the lack of digital nasties more than make up for the cludgy ergonomics and a rather basic level of external polish. Ed has done better since, if you are willing to jump up in price from the CDSA at $11,500 to the two box TSD1 / DAC2 combination at $20,500 which I reviewed last year. Fit and finish are much improved and the sound is both bolder and more resolving. Multiple digital inputs are provided and all inputs are asynchronously connected to reduce jitter. But for me that was one step forward and one step back, since now there are two boxes to rack, two power cords and a extra connections to worry about. For me the simpler the better, and the heads-up that Ed was working on a new one box player/DAC was music to my ears. This new player, the XDS1, is by no means the integration of the TSD1 and DAC2 into one box at a somewhat lower price that we might have expected. Instead, it is a back to the drawing board design to optimize each element in the player for the highest possible performance. If you have the patience, I�ll take you through each of these in turn. All of them are important to the sound and some of them include strikingly original design elements. The box must provide a stable platform for the drive mechanism and facilitate isolation of each of the major subsystems from the others. The XDS1 retains the same reasonably compact dimensions as the CDSA, but the bottom plate is now a thick slab of milled aluminum instead of sheet metal. The feet, which include a mechanical isolator, are machined from aluminum blocks. Improved shielding between the components extends even to the display panel. A quick look inside reveals the modular approach taken to shield the electronic components from the power supply and control mechanisms. The chassis is internally braced and damped to eliminate resonance. The unit weighs a substantial 37.5 lbs, well up from the 26.5 lbs weight of the CDSA SE. You can select either a silver or black finish. Ed Meitner has always used switching power supplies in his digital components. He maintains that they are more efficient than linear power supplies and inject less interference on the line that can travel back to other components. This incarnation is a newer version of his classic design, aimed at minimizing noise levels. Like its predecessors it has power factor correction (PFC), and in this implementation it is the superior active form of PFC rather than the more common passive form. The XDS1 has been tested and is CE compliant. The power supply is now more impervious to the imperfections on the input power line, so will likely be less cable sensitive. It now reaches 95% efficiency, contributing to the cool running of the unit. To achieve the desired quality, the transformers are custom wound. A high voltage rail is created from the input line, and lower voltages are derived from this high voltage line rather than directly from the input. This isolates the low voltage power feeds from phenomena present on the line. Switching frequencies are synched to the audio clock, since experiments have shown this approach minimizes jitter (timing inaccuracies). All the low voltage feeds are very tightly regulated to ensure optimal performance in the signal path. A good proportion of the cost and the performance of the XDS1 can be directly attributed to this remarkable power supply, which sits to the left and runs the full height of the chassis. 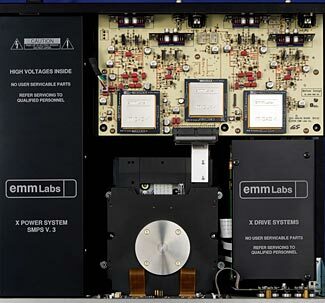 You�ll see it labeled EMM Labs X Power System SMPS v. 3. For the first time, EMM Labs specify an Esoteric VSOP drive unit, rather than the European drives used in earlier models. The box marked EMM Labs X Drive Systems contains the Esoteric control system and the drive itself is mounted centrally and offers a slim metal drawer for the disc. This mechanism loads discs much faster than before (around 6 seconds for CD and 10 seconds for SACD). It also responds instantly to commands, a huge improvement over its predecessor. A similar mechanism is found in the dCS Puccini CD / SACD Player and several other high end players. The asynchronous input circuitry from the DAC 2 has been further refined in the XDS1. Currently it supports only TosLink and AES/EBU at up to 24-bit/96kHz, but we can expect a firmware update (uploadable through the USB service connection) to support 24/192 inputs in the near future. Although often dismissed in the past as a lower quality connection, EMM Labs assure me the TosLink input included here is a very high performance device capable of superb low jitter communications if the transmitting device is well implemented. It is galvanically isolating � a fancy way of saying it isolates the ground from the ground in the source component. This is an important factor in attaining high audio quality. By contrast a USB2 connector can transfer a lot of noise from the source, particularly if that source is a server or a desktop computer, although laptop computers are generally much cleaner than either servers or desktops. The digital inputs are housed on a small daughterboard, and it is possible that an alternative input board may also be offered in future with a USB input option capable of a full 192 kHz/24bit transfer rate. In fact, over the life of the machine, EMM Labs may offer various upgrades, both hardware and software, to keep the owners up to date. All inputs, including from the internal Esoteric drive, use EMM Labs� proprietary MFAST (Meitner Frequency Acquisition System) asynchronous input mechanism. MFAST appeared first in the DAC2 and has been further refined for this application. Used in place of the more familiar Phased Lock Loop (PLL), MFAST eliminates jitter from the input stream rather than merely attenuation it, and locks rapidly to the incoming signal. EMM Labs have developed their own high speed clock module, the MCLK-1, which they claim sets new records is sub-picosecond jitter measurements. There is now general agreement that the reduction of jitter is a key to maintaining phase coherency and special integrity or the audio output and no expense has been spared here in this vital component or its power supply. Unwilling to surrender its competitive advantage, EMM Labs would only say the clock generator is not based on crystals or atoms. In the interior picture, the central of the 3 large modules on the upper circuit board is the MCLK-1 module. Here�s a component that really didn�t need any improvement. Ed Meitner�s DAC (MDAC-1 module) is a fully discreet, dual differential design which upsamples all signals to 5.6 MHz, twice the frequency of the SACD standard. This DAC features a further refinement of MDAT (Meitner Digital Audio Translator) processing, which avoids both pre and post ringing and preserves all phase information. Conventional DACs convert a digital signal to analog by passing it through a reconstruction filter using interpolation to smooth the analog waveform, which leads to a perfectly flat frequency response but errors in the time domain which show up as audible ringing. MDAT works by dynamically adapting to the transient nature of the musical signal � the exact opposite of the traditional one-size-fits-all algorithm. There have been some small changes in the DAC. Ed believes it is not possible to avoid non-linearities in chip based DACs which is why he prefers the far more expensive discreet component approach. The two converters are better isolated from each other and they are fed by a higher quality power supply. In the interior picture, the 2 modules on either side of the clock module on the upper circuit board are the left and right MDAC-1 modules. Perhaps the biggest innovation over previous EMM Labs designs is the output stage. Unlike the CDSA SE or DAC2, which use high quality op amps in a multi stage output section, Ed Meitner wanted a single Class A output stage with the shortest possible signal path. He achieved this by using discreet components of the highest quality, combining all the necessary filtering, buffering and amplification into that one stage. Simpler is better. Virtually all CD players use a microprocessor to control the user interface and display logic. EMM Labs prefers to use instead a state machine. This has the advantage that it does not introduce a new source of pollution into the system, but it is by no means as flexible as a microprocessor can be. As a result, while we can vary the display brightness to four levels, and have all the usual track access and scan buttons, we can only see the track number and elapsed time for this track. All the controls work very well and the display is very readable at a distance, but the layout of the identical looking buttons takes some getting used to. The remote control is a very nicely milled aluminum device, a good step up from the plastic wand that accompanies the CDSA SE. When asked why we couldn�t have a more intuitive and ergonomic interface, the answer I was given is the Ed does not like to inflate the cost of his products on improvements that do not directly relate to the sound quality. Before we turn to the audio performance, let me point out that this unit has a much more luxurious and responsive feel than the CDSA SE, as befits its $25,000 price, and is a much more flexible unit by virtue of its digital inputs, not available on the lower priced unit. Once again Ed specifies aerospace-grade composite laminate circuit boards. The picture does not reveal the presence of a second circuit board mounted below the visible one. It contains the logic boards for the state machine, the RS232, USB and external IR connections and other non audio path componentry. On the back you have analog balanced (5V) and unbalanced (2.5V) outputs, plus digital outputs over AES/EBU and EMM Labs high resolution Optilink. The internal layout is so perfect it�s a shame the top cover is not a glass window so we could admire it from time to time. The one thing missing is a high/low output switch. EMM Labs components are often used in professional studios, and this switch was provided on earlier models for matching studio requirements for high output. This component is priced out of reach for such commercial applications, so this switch is not longer required. The big question of course is whether it is priced out of reach for audiophiles too. Certainly we�ll need a lot more than a more responsive remote control and some digital inputs to justify the asking price. It will need to be a big musical step up from the CDSA SE. Unquestionably, the XDS1 is the SACD player I have ever heard. The increase in realism over the already fine CDSA SE leaves me at a loss for words. Don�t worry, I�ll find a few and put them down here for you, but let me simply say for now that this is for me the new reference SACD player, and I�m just going to have to trade in the CDSA SE and pack up the Linn Sondek LP12 because I�ve now found what I�ve always been looking for, the absolutely convincing and easy to use source component. Blacks are blacker, dynamic range is unrestricted, frequency response as flat as a pancake and imaging holographic. Music appears unfettered by all the usual imperfections. Of course you�ll need some dam good equipment to go with it, but you can do astonishingly well with a pair of Sennheiser HD800 headphones and a really good head amp like the Graham Slee Solo for under $3000. My speakers, the Wilson Benesch Act 1s have never sounded this good before, aided and abetted by a Parasound JC-2 preamp and the latest Bryston 4B amp, all wired together with Nordost Valhalla cables. I didn�t take as many notes as usual while listening, because I kept getting carried away with the music, but I�ll give you some highlights. Let me get the bad news out of the way first. One recording which I had thought pretty highly of before, Ravel�s Bolero played by the Minnesota Orchestra under Stanislaw Skrowaczewski [MFSL UDSACD 4002] turns out to have a number of the string players very slightly out of tune. On previous plays the strings merged nicely together, but the greater resolution proffered by the XDS1 reveals the slight discord and sharply lowers my enjoyment. That one recording aside, every other disc gave me new insights and increased musical thrills. Here�s the play-by-play. The XDS1 pulls furthest away from the CDSA SE on complex large scale pieces where its higher resolution, stronger bass extension and improved dynamics are most easily assessed. You can hear the hall itself, one listener remarked. It is so hard to get the power of a symphony orchestra in full cry into your living room without losing the precise imaging you can get in smaller scale works, and without a softening of transients as the volume level rises. What we get here is big time linearity, and that�s what makes it all so convincing. What a performance! The improvements here are certainly more marginal, since the CDSA SE does such a superb job already. Yes there are some small details I hadn�t noticed before, and the image is a little better defined, but if this is the kind of music you like to listen to, I would not pay the extra. This disc again gains very little from the CDSA SE, which was doing it full justice already. It�s a delight from start to finish on either machine. Small scale music but this time superbly recorded. The CDSA does a superb job here but it is left in the dust by the XDS1 which reveals depths, subtleties and tonal beauty the CDSA simply misses. The piano tone on Gabriella Kafer�s Chopin Barceuse is fuller, darker and richer, better suiting the material. Paganini�s Carnival of Venice is both more intricate and more dynamic than before while Kalman Olah�s Improvisation on a Love Song, always a stand out, is now a peerless testimony to how little the recording process can impinge on a live performance. The perfectly black background and impeccable transient response and sustain capture the improvisatory nature of this performance to the fullest. Blackbird/Yesterday is simply stunning � every musical strand is strong and crystal clear, a significant advance on the CDSA. Come Together illustrates the extra bite in the deep octaves, Paul�s bass guitar being fully realized at last. While My Guitar Gently Weeps is more beautiful than ever, lean and powerful by turns. This superb record full of African rhythms reveals sharper, faster funkier music than ever before due to the increased level of focus and clarity at the lowest frequencies and the outstanding clear, sweet and smooth treble. Unlike the Bolero recording, here the musicians sound like they�ve improved their skills with this CD player upgrade. Imaging is wider and deeper and the acoustic warmer and more relaxed. You know exactly where every instrument is located, so the sound picture just makes more sense, easier to listen to and enjoy. The closely recorded vocals are more intimate and show less strain than before. Percussion is fast and tight, as good as CD gets and a major advance on the CDSA. In the swaggering title track, time seems to expand to allow extra layers of detail to emerge. There�s huge width and depth of soundfield here, each instrument in its own space. The piano tone, notoriously difficult to reproduce in this track, comes up clearer than before. The bass is particularly tuneful and can be heard even at times when it is obscured by the other instruments through lesser CD players. The percussion emerges with delicacy and precision. Whereas the CDSA was leaner than the fabulous Meridian 808.3 Reference CD Player, the XDS1 is bold, colorful and rich - every bit as good as the Meridian, the first SACD Player I�ve heard to reach that level of Redbook playback. The CDSA is magnificent here and it�s hard to do any better. The XDS1 conveys a bit of extra weight and presence, with imaging more precise and more detail retained at climaxes, but it�s a very close thing. So may players fall down on this original instrument recording, bringing brash strident string tones to the fore. The XDS1, by virtue of its incredible ability to resolve fine detail, breaks chords into their component notes. There is superb weight here, and wonderful lustrous tone, a magnificent achievement for a track that sounds murky on lesser players. This player, even more then the CDSA, reveals the incomparable touch of Rubinstein in his element in Chopin. Every octave of the magnificent instrument Rubinstein plays sings clearly. Superb in every way. In this larger scale music, the improvement over the CDSA is very noticeable. The various orchestral strands are clearer and more precisely located, the piano has a fuller fleshier tone, the pace is fantastic, while miraculously, power and delicacy co-exist in full ensure. The orchestra is laid out before you like a battlefield, with superb depth. Leading edges are cleaner and more colorful. The slow movements are magical, with the piano floating effortlessly above the orchestra. All registers are equally clear, with greater texture to the string sound. Once again the low level deep bass is not drowned out in climaxes, and the bottom notes of the piano are so clearly pitched. In forte sections of the Shchedrin, the piano is commanding, precise and massive, while the orchestra displays spiky power with unrestricted dynamics. The XDS1 raises the already magnificent performance of the CDSA to sublime levels. This is absolutely demonstration class, like listening to master tapes. The XDS1 has digital inputs on the back, so let's try them. My first test was to see if I could drive it as a DAC using the digital output from the machine itself. No dice. You can use it as a CD Player or as a DAC or as a Motor unit, but you can't get this particular combination working. So I used the AES/EBU balanced output of the CDSA SE as a digital source using a sleek Valhalla digital cable kindly provided by Nordost for the occasion. It locks onto the signal immediately, as it does using a TosLink connection from the output stage of a Meridian G08 CD Player, but it does not show you the data rate. Room for improvement there. The CDSA SE driving the XDS1 gives a more robust, forceful presentation than the CDSA SE alone. The image is stronger and the background darker, while the level of resolution rises considerably. The step up from this arrangement to the XDS1 used as a CD player is a big one, perhaps twice as big. There are so many variables here it's difficult to know how much to attribute to the far more expensive motor unit in the XDS1, how much to the clock, how much to the AES/EBU connection itself, how much to the power supply, shielding and chassis. I would say it is unlikely you would ever use an external SACD or CD drive unit with the XDS1 since the internal one works so well on an absolute basis and as a package with the internal DAC. Those digital inputs are more likely to be useful for music servers, hirez downloads, even iPods. The fact that the DAC in the XDS1 was able to improve on the performance of the CDSA SE's internal DAC (certainly no slouch and directly connected to boot) shows it reaches a very high standard indeed. Clearly the XDS1 trumps the CDSA SE in every important way (except price), but how does it compare to EMM's best two box solution, the TSD1 and DAC2? (see my review of those here) This question is a little harder to answer because I don't have that combination on hand but on the other hand I do have detailed notes and quite a good memory for these things. The two box combo bests the CDSA SE in all respects (except price and compactness). It's a great combination and offers more flexibility than the XDS1. But it does not have the responsiveness to user input that the Esoteric drive brings to the equation, and the sound quality is roughly half way between CDSA SE and XDS1. Blacks are blacker, presence much stronger, dynamics amazing. All of these units are superb sonically, and you'd be hard pressed to find another manufacturer's product to touch them for musicality. But the degree to which the TSD1 / DAC2 surpasses the CDSA SE took my breath away at the time. The leap up from there to the XDS1 brings a broad grin to the face and surprise at how much more satisfying my music collection is than I'd ever known. As you move up the EMM Labs range, all the earlier strengths are built upon and refined, as you hope for and expect. The only real change in the character of the performance is the move away from the leanness of the earlier designs to a more muscular strength - meat on the bones. In short, SACD performance is raised to unmatched levels in my experience, while CD comes closer than ever before to SACD. In every single area of performance, resolution, timing, transient response, decay, image size and depth, frequency response, dynamics and tone color, the XDS1 improves on all digital players I have heard before. I�m sure one day this machine will be surpassed, and maybe that will be by some future model from Ed Meitner, but for now, this is the state-of-the-art, and as musically satisfying a machine as I could wish. For that reason, and for how it performs in comparison with other expensive hardware, I am forced to admit it represents good value for money too. You can�t get there for less. EMM is gratified that our efforts to make the best player/converter that we know how has not escaped Mr. Gold's notice. We believe the XDS1 is the most musically satisfying and sonically accurate converter we have ever made. We are proud that Mr. Gold has made it his new reference.